Note: many browser block Java applets. Perhaps you’ll have to make do with the screen-shot. Dutch bicycles have a reputation of robustness and quality. It’s true, but they are also heavy – and slightly traditional: My bike had only 3 gear positions. Of course, this didn’t prevent me from climbing a few hills (almost) daily on my way to work – but I figured that some of my joints would last longer if I disposed of a lighter gearing. So I purchased a standard french bike, that has 3 blades in front and 7 at the rear – which makes 21 gears. It’s not hard to find out which positions are the lightest or the hardest, but the order in between requires some arithmetic. After 2 years, I finally decided to count the number of teeth on each blade, and to calculate the transmission ratio. 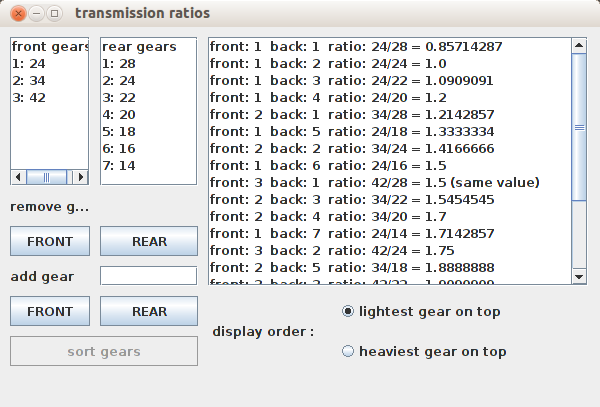 Only then did I discover that 2 combinations gave the same result: so I only have 20 gears at my disposal ! In any case, I wrote a small programme for this (I wanted to learn Java anyway) and you’re invited to have a look. You can enter the sizes of your own blades (if you bother to count them).